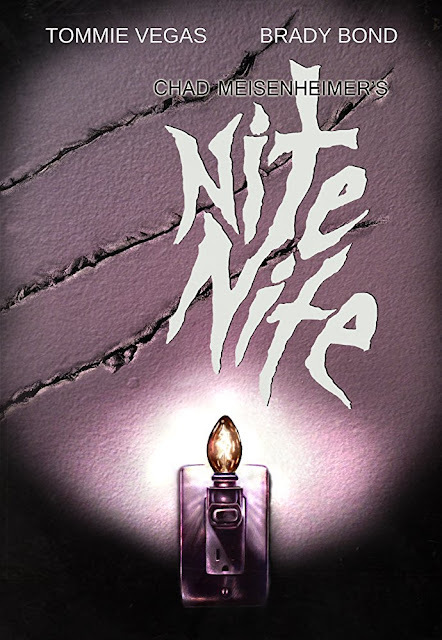 Setting NITE NITE in 1985 is clearly an homage to the babysitter slasher films of that era. Iconic films like HALLOWEEN and WHEN A STRANGER CALLS have influenced most horror films of the last 40 years, and Chad Meisenheimer's film is no exception. This 3.5 minute short follows a 7-year-old boy (Bond) who tries to convince his babysitter (Vegas) there is a monster is in his room. While the plot (and electronic score) might sound like John Carpenter the execution is something more akin to Tom Holland's 1985 horror/comedy masterpiece FRIGHT NIGHT. Meisenheimer injects a playfulness into his film that is never overt or distracting. He allows Bond to play with his character in a way that's difficult to read and gives the film its greatest strength. Ambiguity. Is our young boy scared or malevolent? Short films can be forgiven all sorts of crimes due to their length. Bad acting, editing, and sound can be overlooked if the story has a decent hook. A short film is really similar to a street joke. A poorly executed joke can still get a laugh if the punchline is strong enough. But if you've ever heard Gilbert Godfrey tell a street joke, you'll see the difference. Execution is what really matters. If a short film has a decent twist the experience is satisfying because it didn't require a 90-minute investment, but if it manages to sink its teeth in within that small window, it'll make an impression. They either leave you wanting more from the film or the filmmakers. NITE NITE falls into the latter category. It's a tightly constructed story that feels complete and I want to see what Meisenheimer will do next.